So Nintendo has announced, after years of questioning, petitions, and feedback they will be re-releasing cult classic SNES game Earthbound in the US. In 2008 there was discussion that the game would make its way onto the Wii's Virtual Console. It was rated by the ESRB but never released. The game's Japanese counterpart appeared as a demo on Super Smash Bros. Brawl and later as a full title on Japan's Wii Virtual Console. Unlike the other demos included, Earthbound was removed from the US release of Brawl. Now -- years after the Wii requests, which came after years of begging for any sort of release -- Nintendo is happy to announce Earthbound is returning to the US: exclusively on the dead in the water 'top-selling' Wii U. An alternate ending to this week's comic involved Elliott going to the hospital because he hate the cake and asking to leave so he could "Go buy a Wii U." Jim tells him he's made enough bad decisions for one day. I opted against it because I couldn't bare the thought of a world where Elliott wanting a Wii U is Nerd-Rage-canon. Fun fact: if you don't already own Earthbound and you don't own a Wii U, it would still be cheaper to buy a used cartridge than to buy a Wii U and download the game when it comes out later this year (despite continually raising aftermarket prices). 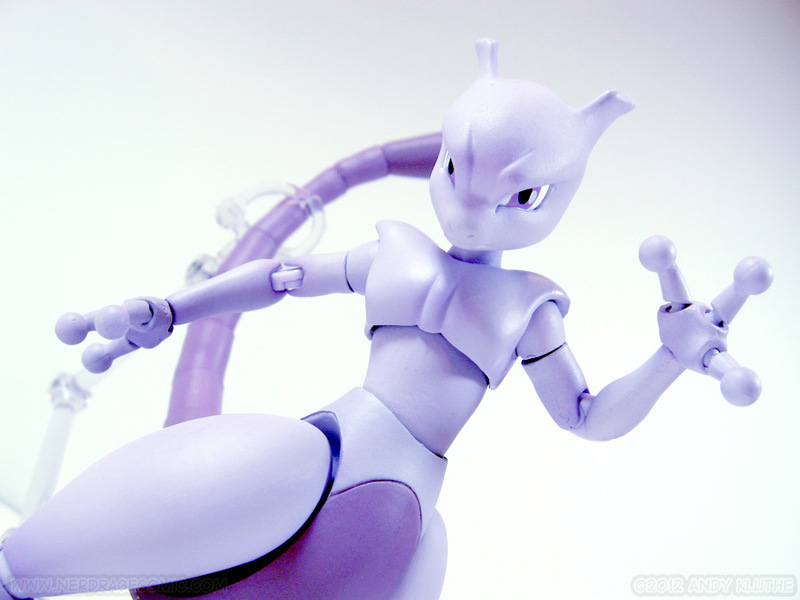 Be sure to check below for a review of Bandai's D-Arts Mewtwo! Two reviews in a row? What is this madness? The box is two-to-three times deeper than the average Figuarts box. On the front you have some stylized monochromatic art of Mewtwo by the plastic window. The back has images of the figure in various poses. 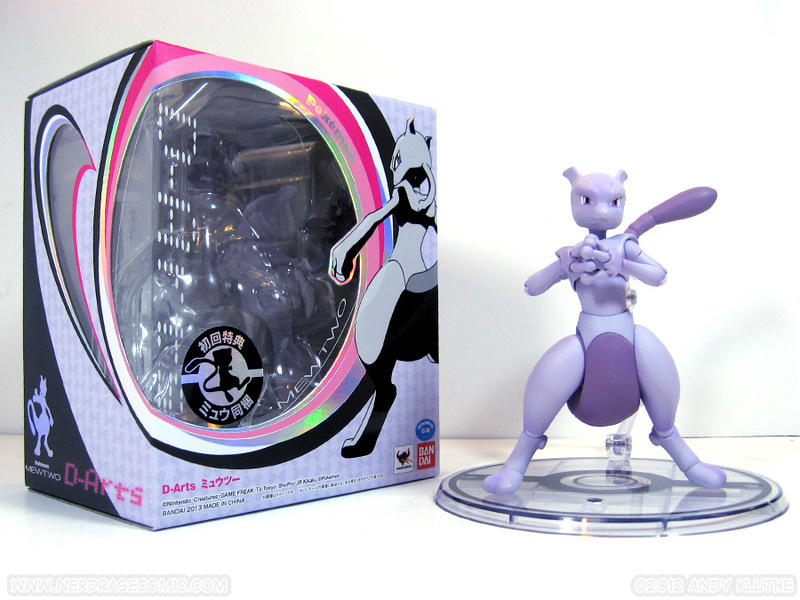 Mine has a decal on the front advertising the first release bonus – a Mew figurine. This is hands down the most articulated Pokemon figure you will find (until later this month when Charizard comes out). Of note, the chest articulation is actually gets some good motion. Each segment of the tail is jointed so the whole thing can flex about freely (thank you, Bandai, for not including a rubber bendy tail – they look cool until the rubber starts cracking or the wire kinks). The joints at the base of the tail give more motion than the rest so that the tail can both curl up for his standing pose, or flow behind him for a flight formation. On a less cool note, the small ball joint on my Mewtwo's left hand causes it to pop off rather easily; so easily that I'm afraid I might lose it. (I need to tighten it with some Future, this sort of thing is an easy fix.) I have no idea if this is isolated to my figure, or a reoccurring problem, but it's something to watch out for. Another minor nitpick – Mewtwo's legs lack true knee joints (the backwards bend would be roughly equivalent to a wrist or ankle, not a knee.) The knee would be in the larger upper ‘thigh', but this is usually drawn or animated as one solid piece. I get why there's no joint; it would break up a smooth piece of Mewtwo's anatomy and look like crap to have a big joint seam across the knee. In most of the standing or flying poses the legs look great; but if you do anything where the knee should bend (jumping, kicking, etc) the pose is going to look off. Because the leg isn't bending. My favorite bit of engineering on Mewtwo is the tube on the back of his neck. 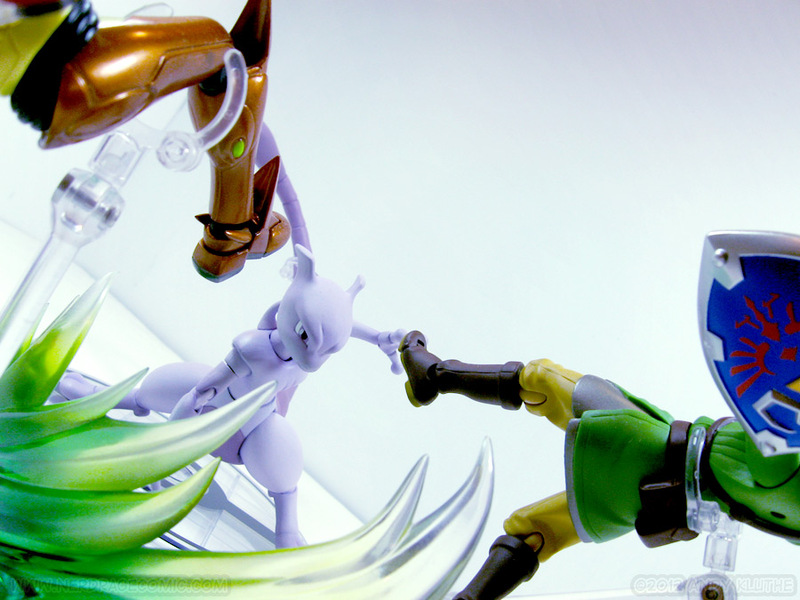 Bandai has cast the piece in rubber and allowed it to slide freely through a hole in the back of Mewtwo's head. This creates the illusion of a seamless piece that can flex as his head turns side to side, and increase/decrease in length as his head tilts forward and back. It's really cool. I was really impressed by this, mostly because I assumed flat colors would be considered ‘good enough' on a figure with mostly flat colors. 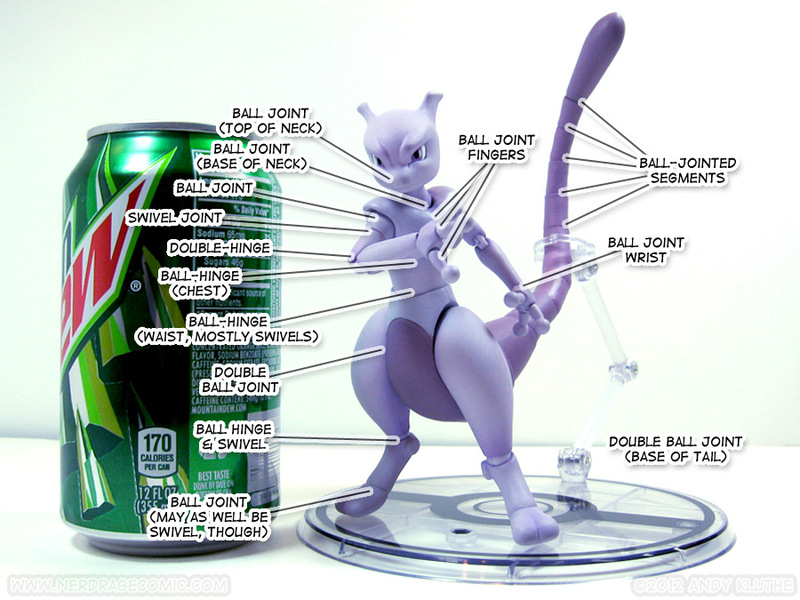 Instead, Mewtwo has gorgeous airbrush shading all over his body, shading the inner joints and various details of his body. The body is also a nice matte finish, while the eyes are gloss. In the way of extra hands or effects parts, Mewtwo is pretty sparse. Bandai has forgone additional hands in favor of putting a balljoint in each finger. In Mewtwo's case this is affine decision, because there's not really any extra pieces (guns, swords, etc) that he needs specific hands to hold and he isn't exactly known for having any specific hand gestures. 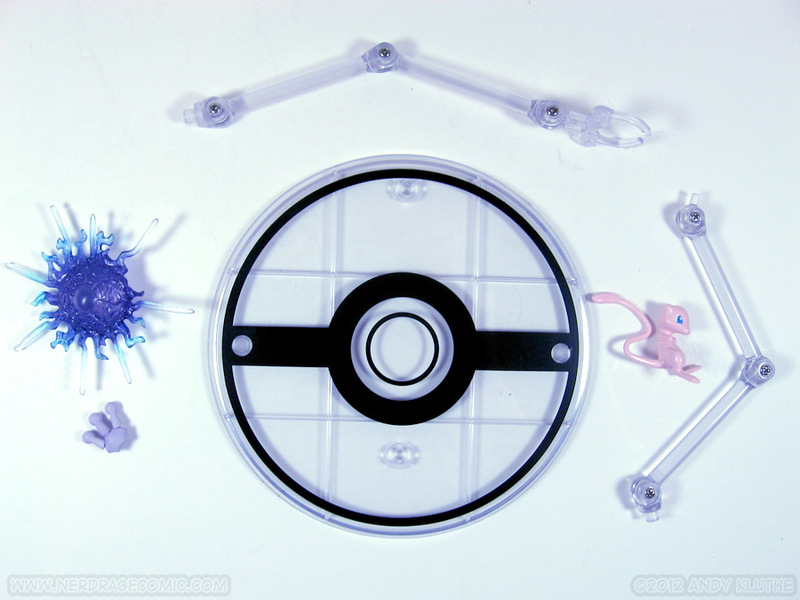 The one extra hand included has a peg and one non-jointed finger so that Mewtwo can hold his single effects part: a plastic disc that (I'm assuming) represents Shadow Ball. This piece only effectively works from one angle. Because his shadow ‘ball' is actually more of a shadow disc. I know in the Smash Bros. series the attack is technically a flat effect with a clear center; this piece tries to do something similar. Coupled with the fact his tiny wrist joints aren't real strong, this piece isn't really doin' it for me. 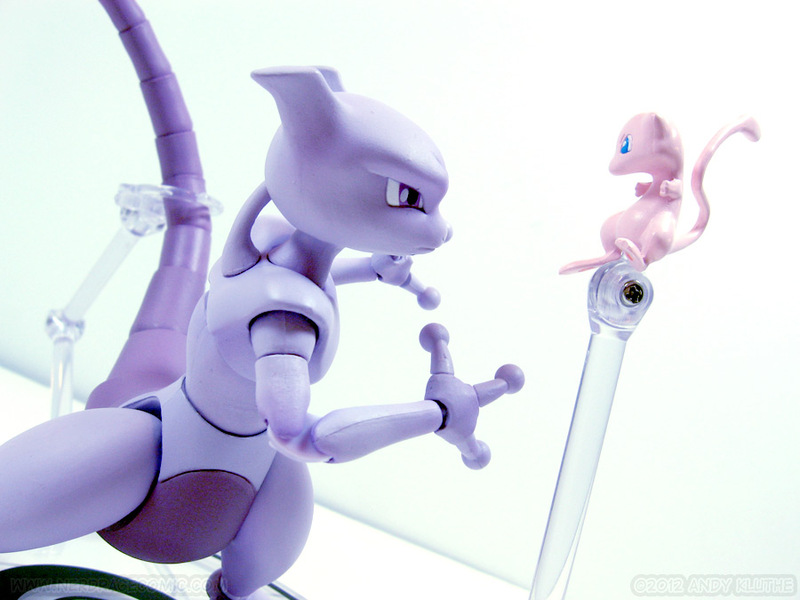 And you will need a stand to keep Mewtwo up, between his teeny feet and his giant tail. Unfortunately, Mewtwo's waist sits much lower than most D-Arts (or Figuarts), so the waist-grabbing claws don't work as they should. His waist is so low that when his feet are on the ground, the arm can't bend far enough to get the waist clamp that low. 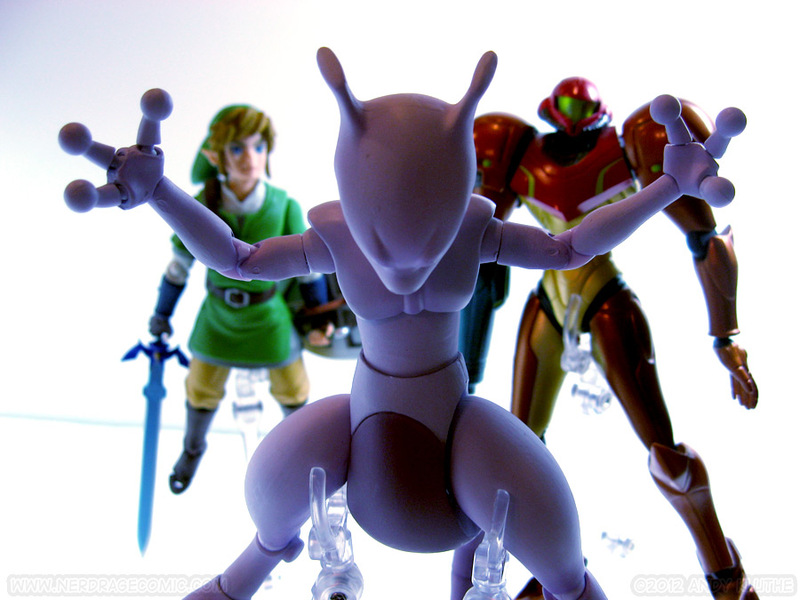 Mewtwo is also kind of back-heavy with his massive plastic tail. Thankfully, I've found using the stand to grab the back of his tail works fine to keep Mewtwo upright. 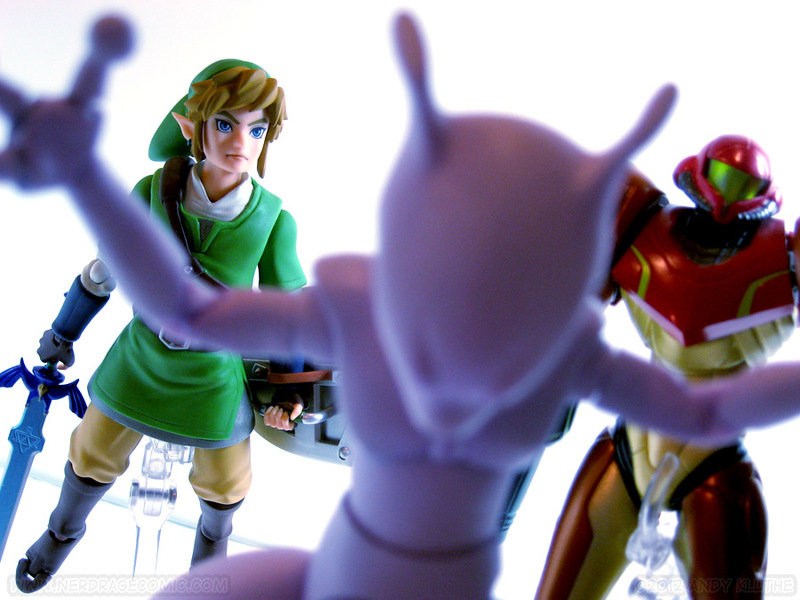 • The best Mewtwo figure you can buy. Far more articulation than Pokemon toys usually get (Jointed fingers! Jointed tail!). •You get a free Mew if you opt in early. •The effect part falls flat (literally). •Limited to standing and some flying poses thanks to the lack of knees. •Even with 11 segments, there's only so much motion you can get out of a segmented tail. •He won't stand on his own and there are some issues with getting the stand to hold him. I don't write these reviews to tell you if you should or shouldn't buy a figure; I try to present potential perks and flaws and leave the decision up to you based on your own opinions. Collecting is subjective and not everyone buys something for the same reason. Some people just want it to look like the source material; some people want articulation. Mewtwo has some divisive design decisions. The tail is a compromise between form and function. A rubber, wire tail would have more natural ‘articulation' but doesn't tend to hold up. A solid plastic tail looks the most accurate but forgoes articulation. If you're a Pokemaniac and like articulated figures, though, this is probably one you'll be interested in. Mewtwo will not be hitting the US, due to licensing issues. Takara Tomy holds the US merchandising rights once again, and has denied Bandai's request to release the D-Arts here. 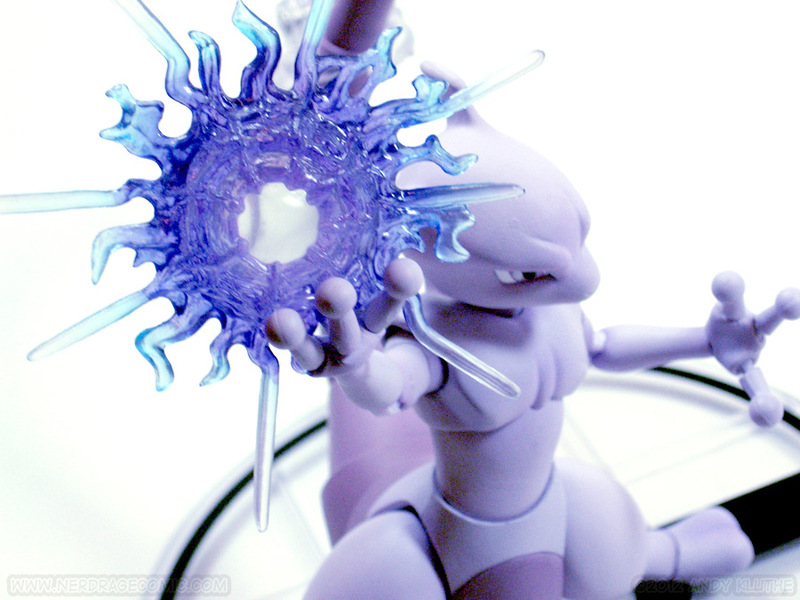 If you're interested in ordering D-Arts Mewtwo, you'll have to import. Mine came from Amiami, but they are currently out of stock. Keep an eye on them or HLJ for a possible restock in the future!